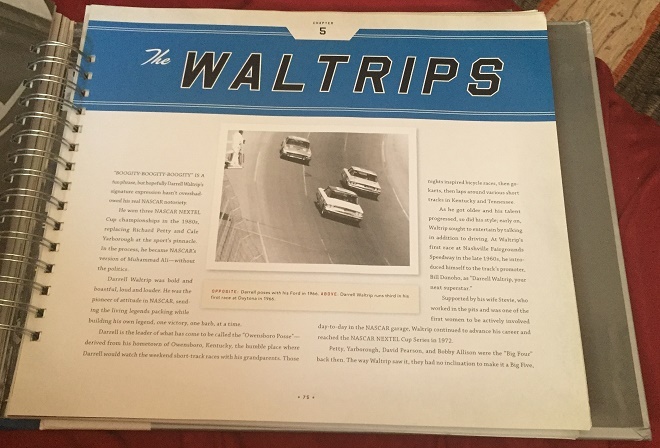 There have been dozens of books written about NASCAR. 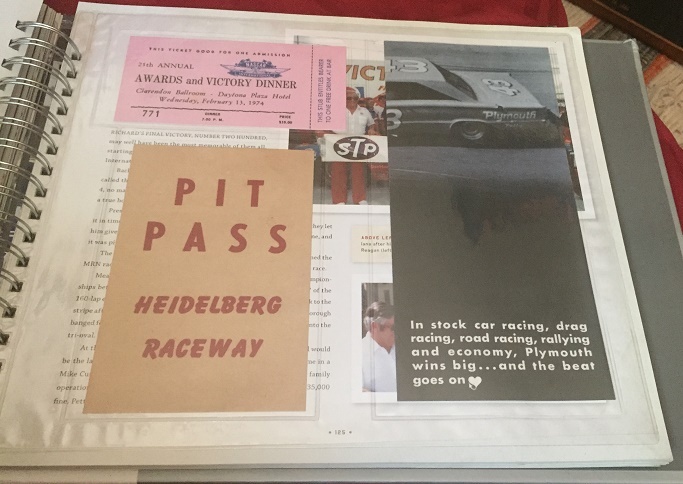 These books cover everything from NASCAR history, drivers, races, personalities, cars, equipment, and many other subject. 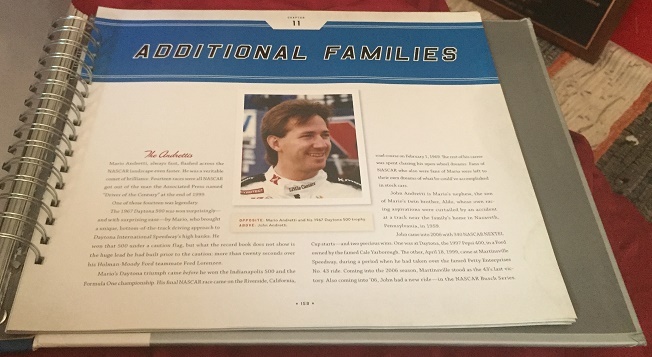 One of the most unusual books was published in 2007, The NASCAR Family Album. 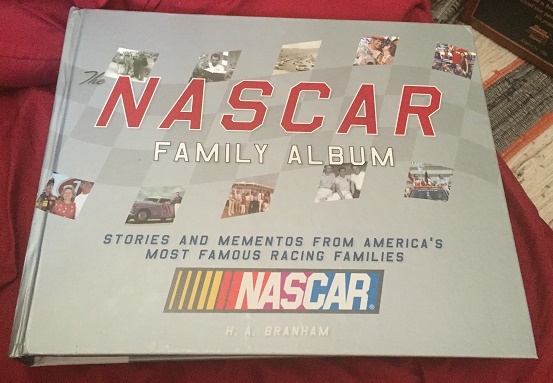 This book covers the history of some of the most well known families in NASCAR. That by itself is an interesting subject. 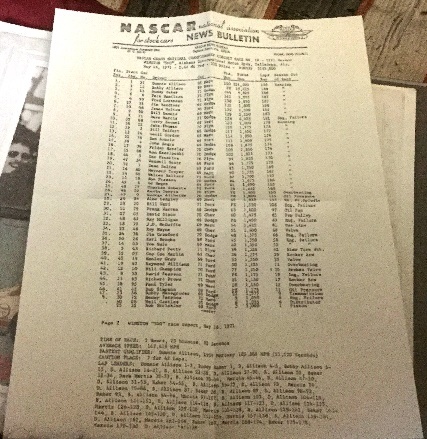 There have been many interesting families in the history of NASCAR. 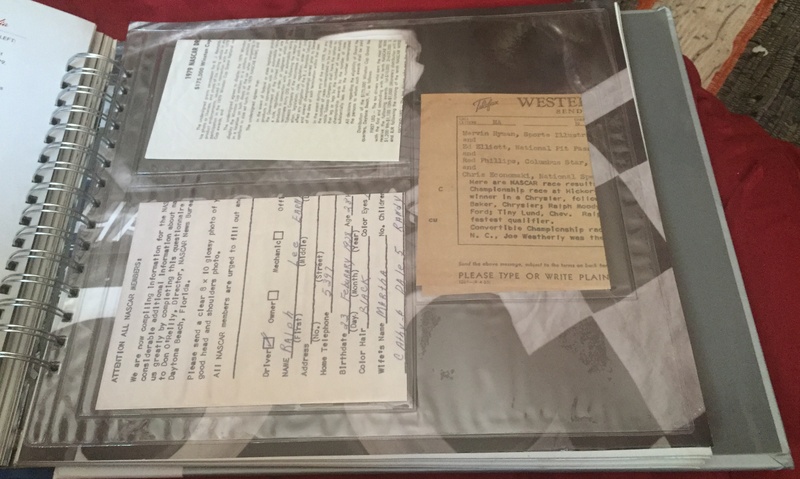 What makes this book so interesting is that the book includes replica memorabilia from those families. 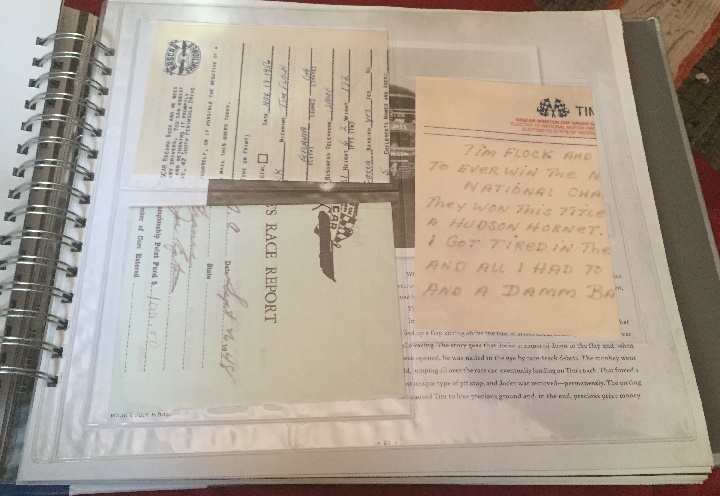 These items, made very faithfully to the originals, are replicas of racing items from those families. Reading these items is a fun experience. The first family to be featured is the France family. NASCAR was founded in February of 1948 by Big Bill France Sr. who ran it until 1972, when his son Bill France Jr. took over. 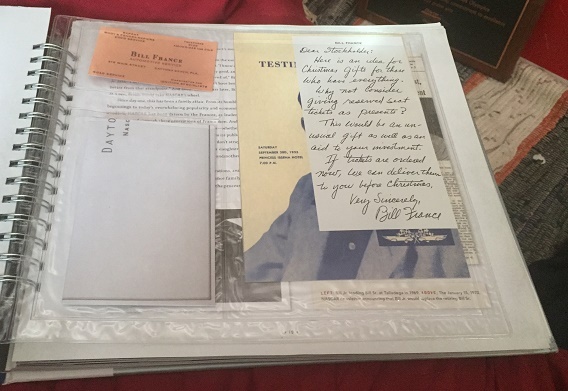 Bill Sr. died in 1992. 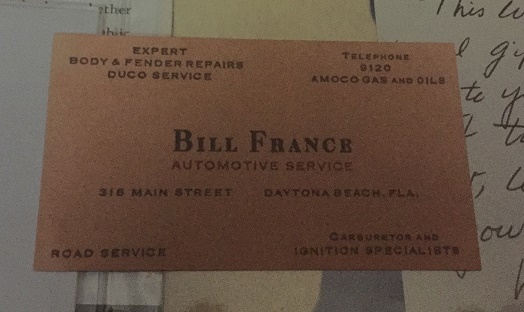 Bill France Jr. ran NASCAR from 1972 to 2000, when he was diagnosed with cancer. 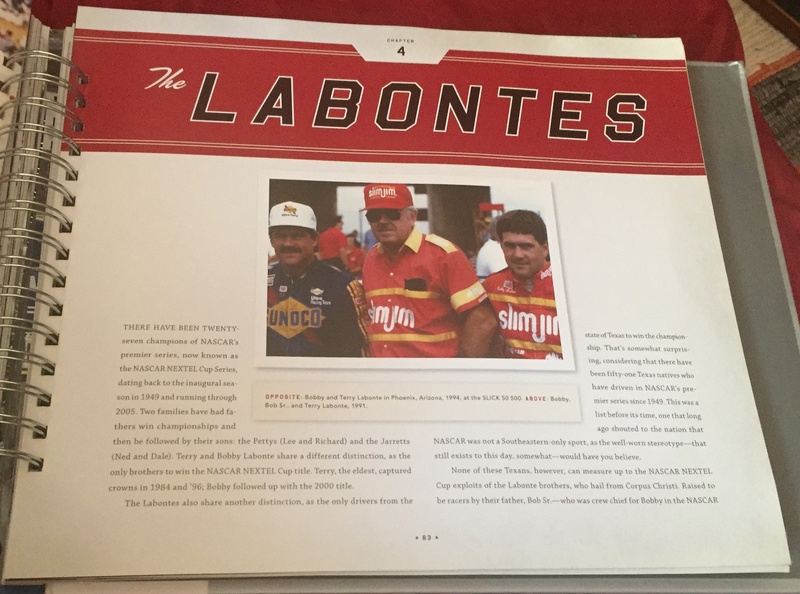 He turned the reigns over to Mike Helton, and remained on the board of directors until he picked Brian France as his replacement in 2003. He w died from lung cancer in 2007. Brian France is the current owner of NASCAR, having run the sport since 2003. 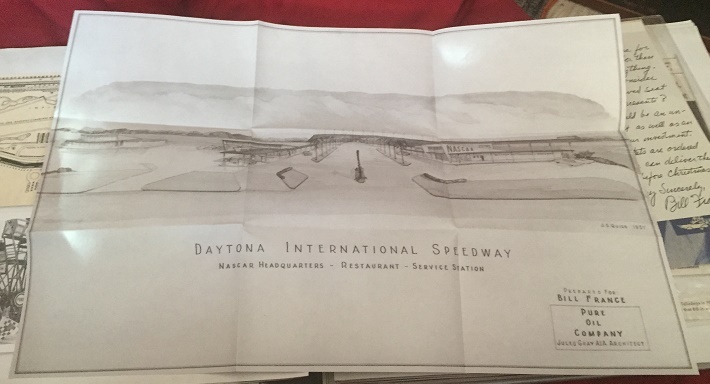 The replica memorabilia for the France Family is Bill France’s business card, A hand-written note from Bill France Sr. to a stock holder, Three pages from the Bill France Sr. Testimonial Dinner from 1955, and a conceptual sketch of Daytona Motor Speedway from 1959. The second chapter focuses on the Jarretts. 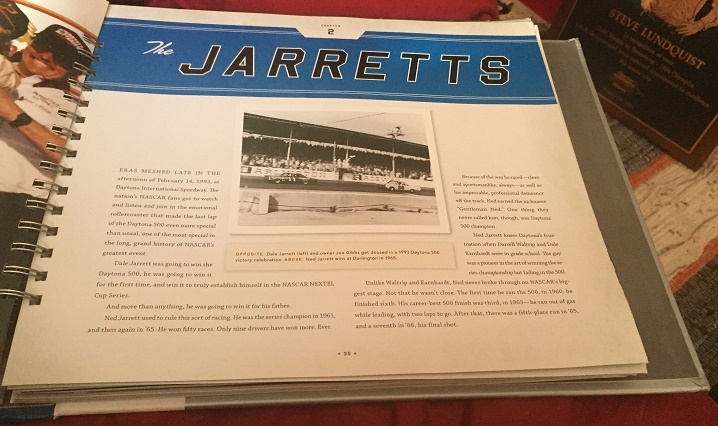 Ned Jarrett is a two-time Sprint Cup champion who raced from 1953 to 1966. 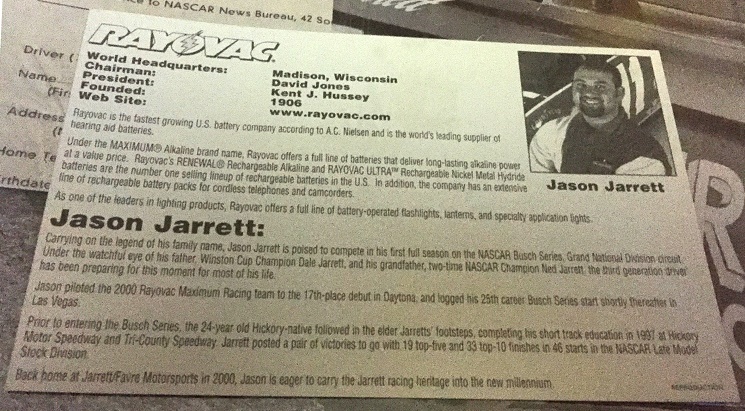 His son Dale Jarrett raced from 1984 to 2008 with 32 race wins and the 1999 Sprint Cup Championship. Both are on the list of the 50 Greatest Drivers of All Time. 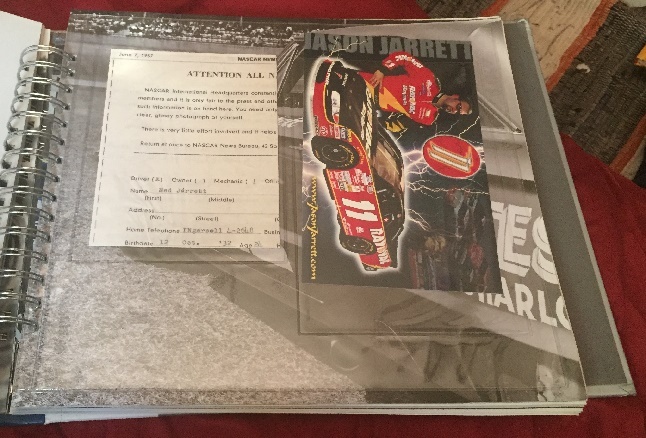 The memorabilia included here includes a replica of Ned Jarrett’s 1957 NASCAR Information Sheet, and a Jason Jarrett post card. 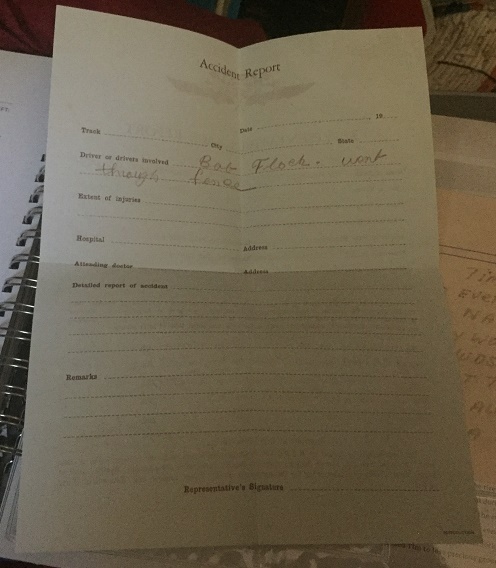 If we take a look at the replica, and compare it to the original, its a very faithfully executed replica, only smaller, and with the word REPRODUCTION on the bottom right corner. 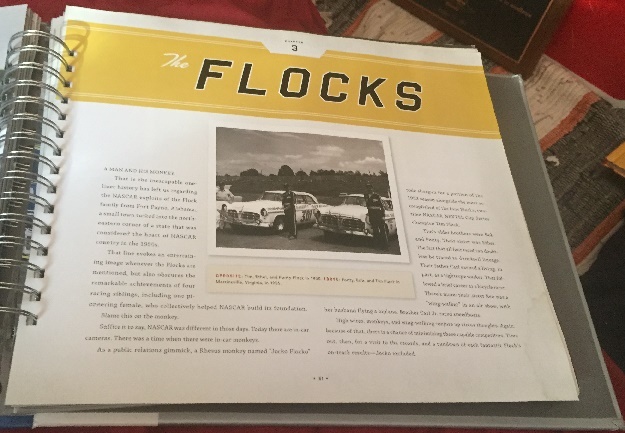 Chapter 3 focuses on the Flock Brothers, Tim, Fonty, Ethyl, and Bob. The Youngest of the group, Tim was the most well-known of the brothers, having won 39 races and two championships. 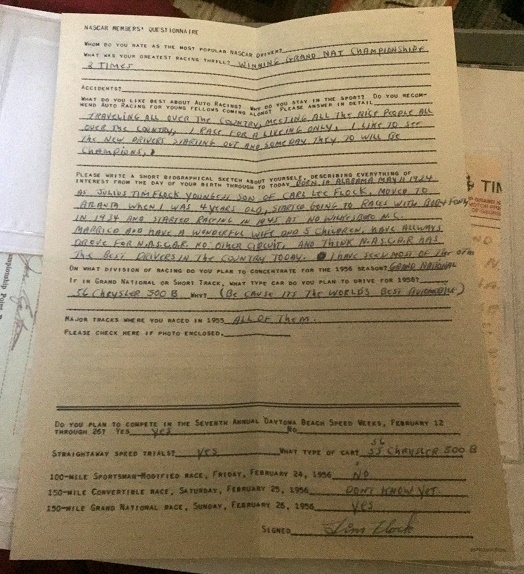 Tim was banned after the 1961 World 500 for having too much solder on his carburetor screw, but it was most likely retaliation for wanting to found a drivers’ union. 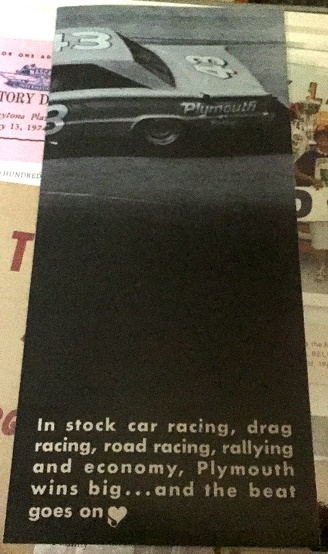 He was reinstated as a driver in 1966, but never raced in NASCAR again. Like Ned and Dale Jarrett, he was enshrined into the NASCAR Hall of Fame, and was one of the 50 Greatest Drivers of All Time. 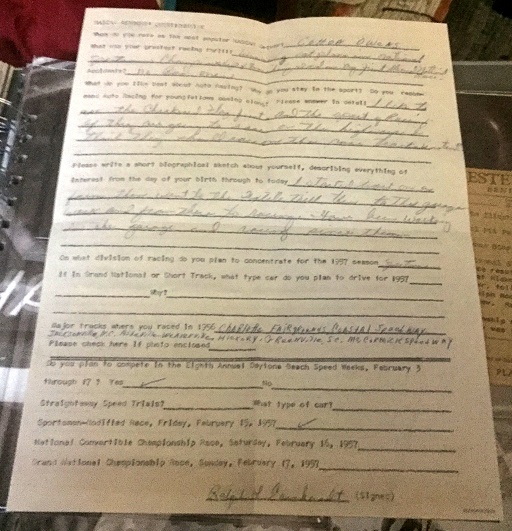 The oldest of the family, Ethyl, was tied as the second female driver to race in, NASCAR,with Louise Smith and after Sara Christian. She had a career high of 11th. The next oldest was Bob, who had 4 wins in his own right, and once got into a police chase IN THE MIDDLE OF A RACE! 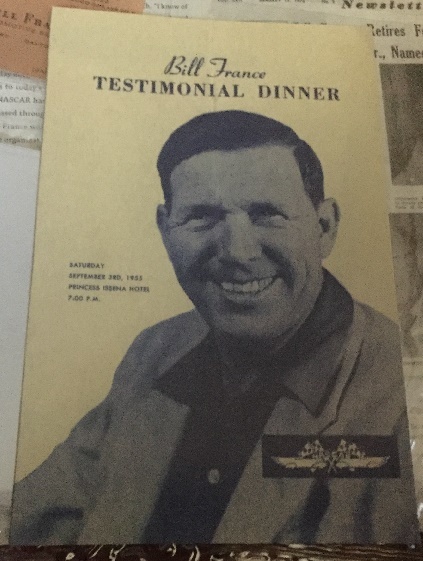 Fonty was the third oldest, and second most successful of the brothers, having 19 wins and finishing second in 1951. 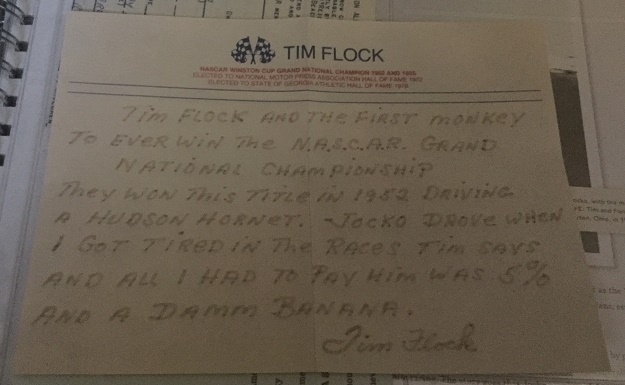 The memorabilia for the Flock family consists of the first two pages of Tim’s 1956 NASCAR profile sheet, A hand-written account of Tim racing with his monkey Jocko, and a 1948 detailing a race where the Flock brothers finished first, second, and fourth. Next we move on to the Labonte Brothers. 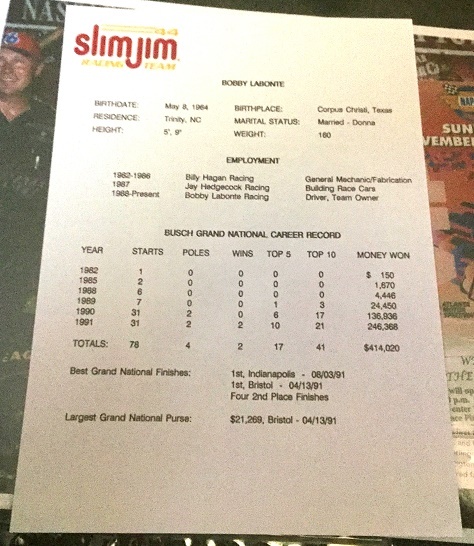 Older brother Terry won two Sprint Cup championships, 12 years apart from each other. 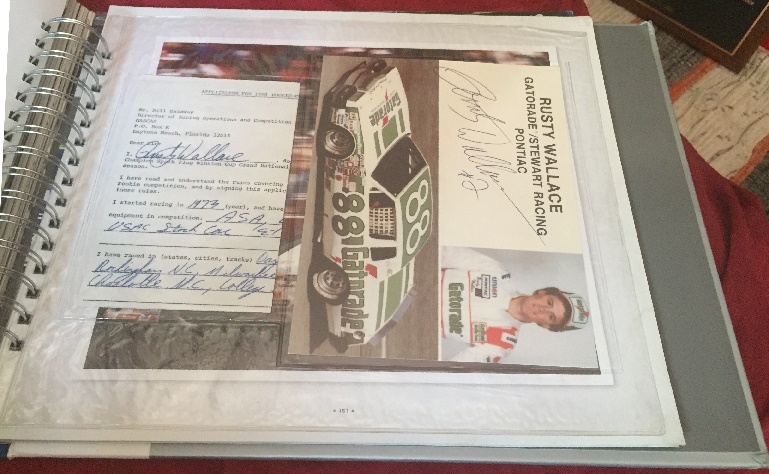 He won the 1984 championship while driving for Hagan Racing, and the 1996 championship upset driving for Hendrick Motorsports. He has 22 race wins, and is one of the few drivers who has won in the Cup, Xfinity, and Truck Series. Another one of the 50 Greatest Drivers of All Time. Bobby Labonte won the 2000 Winston Cup Championship, and has 22 races to his credit. 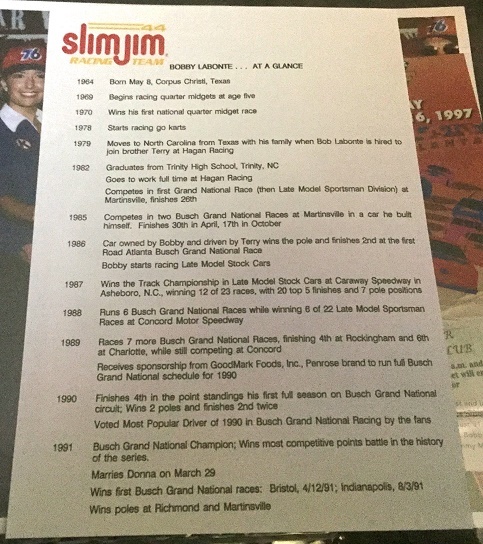 He is also the first driver to win Sprint Cup and Xfinity Championships. Like Terry, he is one of a select few drivers to win in the Cup, Xfinity, and Truck series. 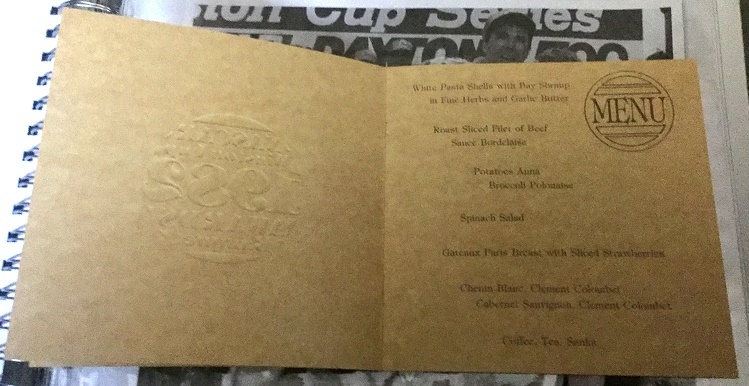 Justin Labonte is also discussed here, but his career never really lived up to that of his father’s. 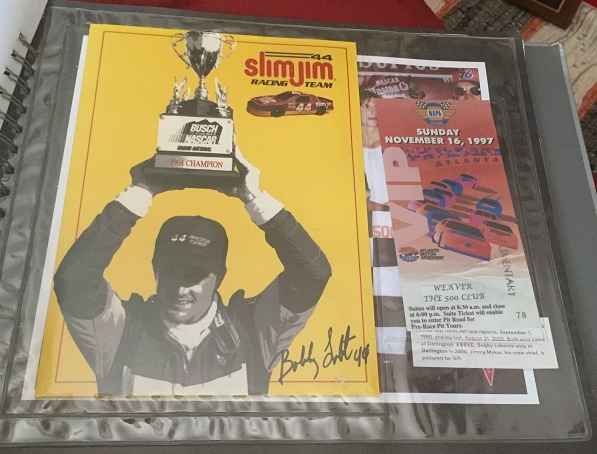 The memorabilia included here includes a Bobby Labonte press kit from 1992, and a ticket to the 1997 NAPA 500 at Atlanta motor speedway, where Bobby won. Darrell and Michael Watrip are the next family featured Darrell is a three-time Sprint Cup champion, who has 84 race wins to his credit. 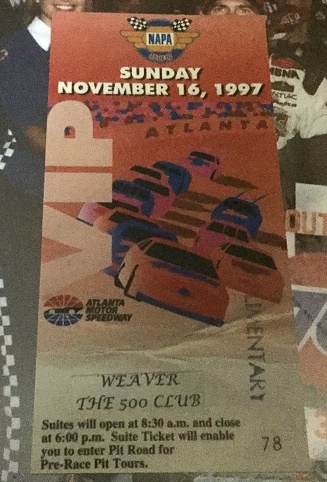 He is one of the few drivers to win the career Grand Slam, including winning the 1989 Daytona 500. 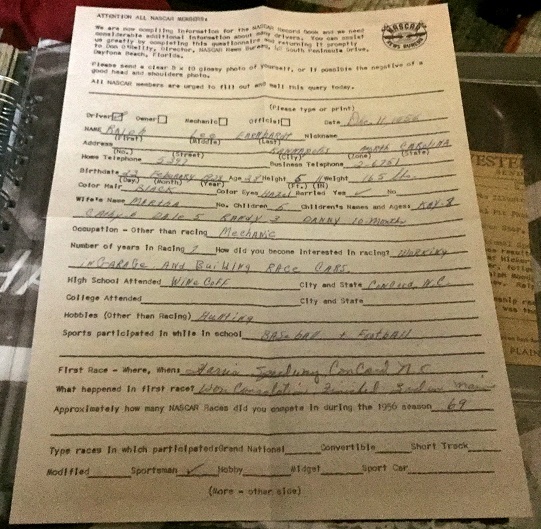 He was named one of the 50 Greatest Drivers of All Time. Younger brother Michael has 4 Sprint Cup wins, including two Daytona 500’s to his name. 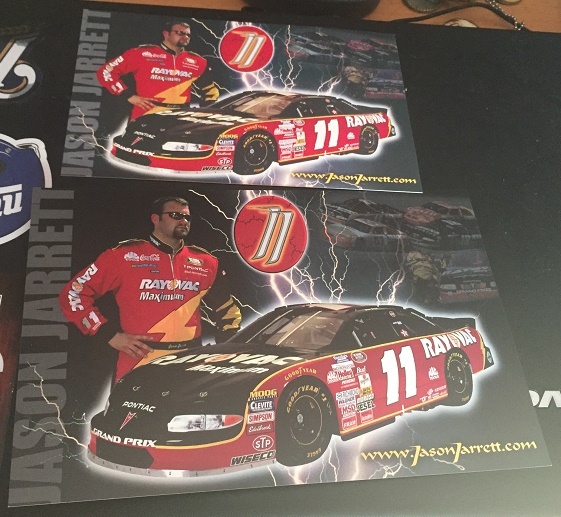 He also has 11 Xfinity Series wins, and a Truck Series win, making him a Triple Threat. Michael is also a former All-Star race winner as well. 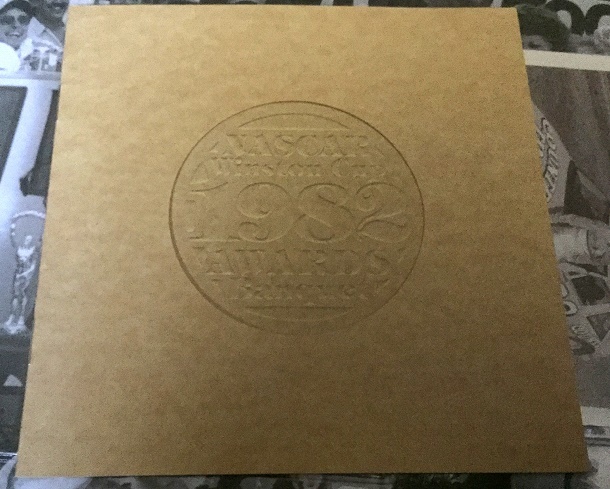 The memorabilia features the 1982 NASCAR Awards Banquet program, commemorating his second Championship, and a Michel Waltrip postcard from the 1990’s. 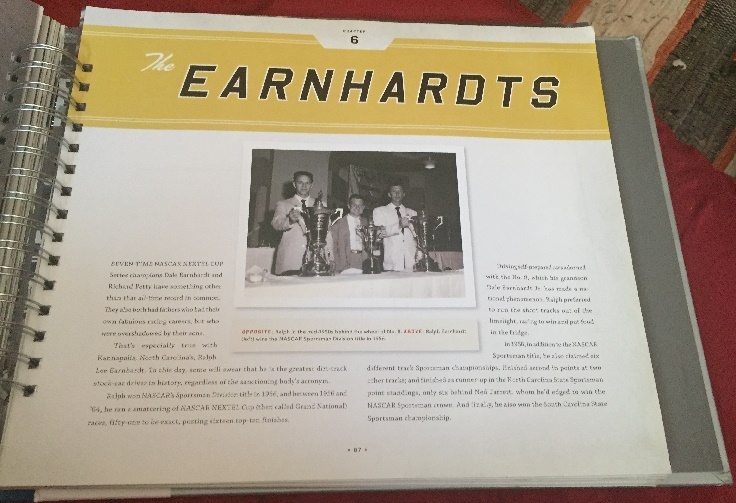 The Earnhardts, my favorite NASCAR family is featured next. 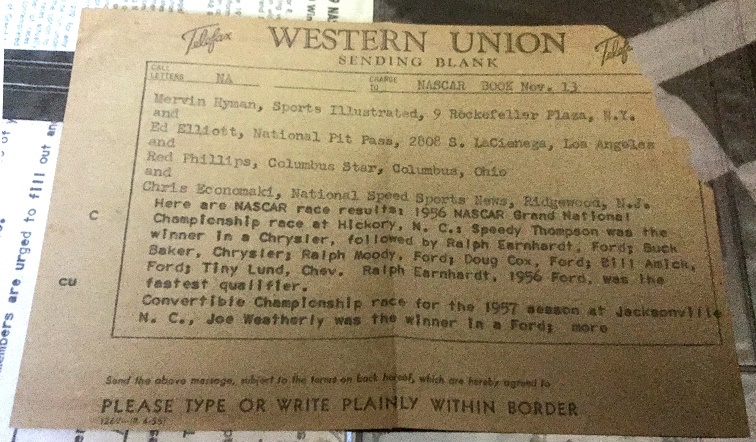 The patriarch of the family, Ralph raced in NASCAR’s Sportsman Division, winning the championship in 1951. 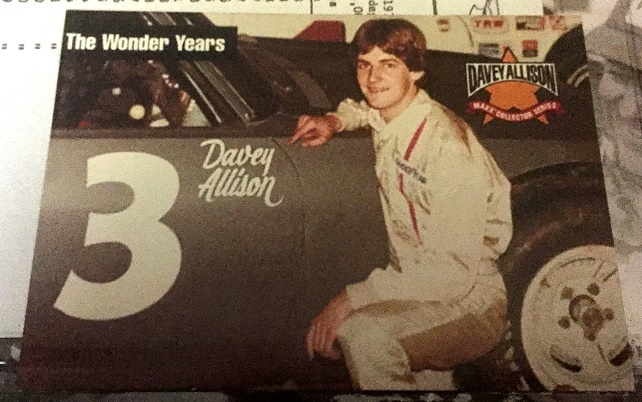 He then made it to what is now the Sprint Cup Series, but didn’t score a win. 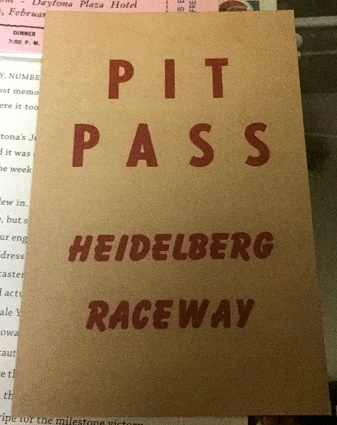 He was also a builder of cars, and helped many young drivers including Bobby Issac a shot at racing. 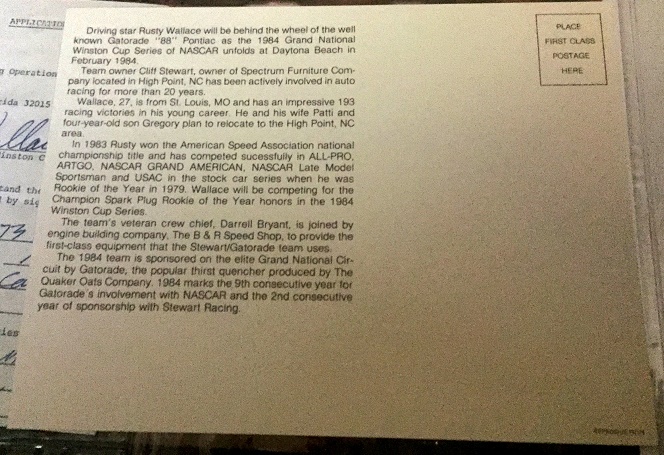 His third son Dale Earnhardt Sr. started racing after Ralph’s death in 1973. He started what was his rookie full time season in 1979, impressing people at the Daytona 500, and eventually winning Rookie of the Year. From there, the only way to go was up, which is what he did. He won 7 championships, a career grand slam, 76 races, and was named one of NASCAR’s 50 Greatest Drivers of All Time. 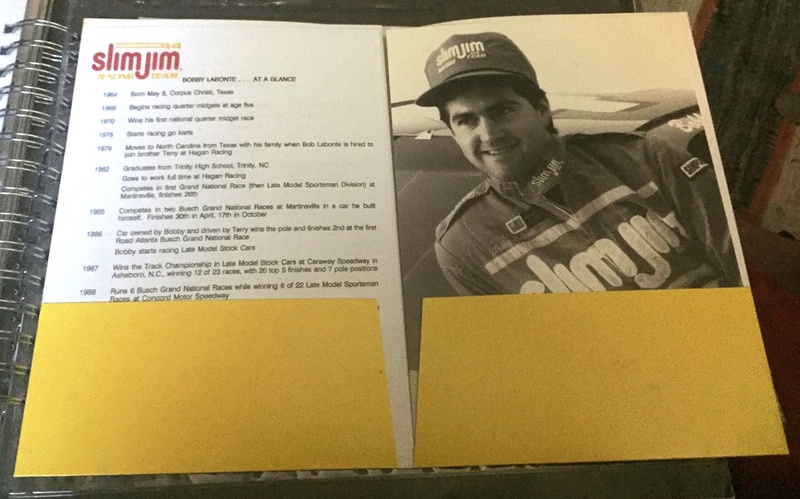 He is also credited with winning the first race in what is now the Xfinity Series. 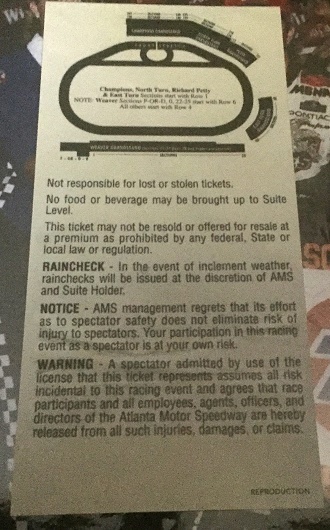 Dale was killed in the final lap of the 2001 Daytona 500, which helped change the safety culture of auto racing. Dale Sr.’s son Dale Earnhardt Jr. followed in his father’s footsteps. 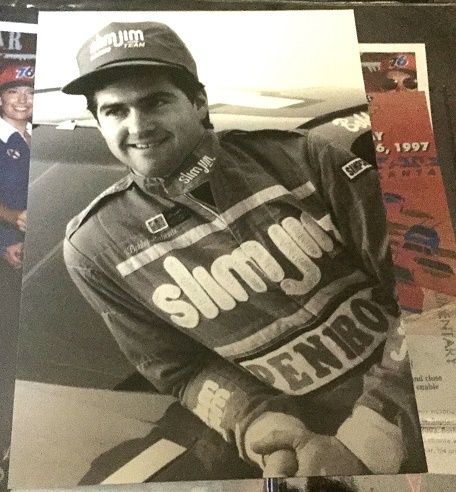 He started racing at age 17, and eventually made it to the Xfinity Series where he won the Championship in 1998 and 1999. He has 24 Xfinity series win to his credit. 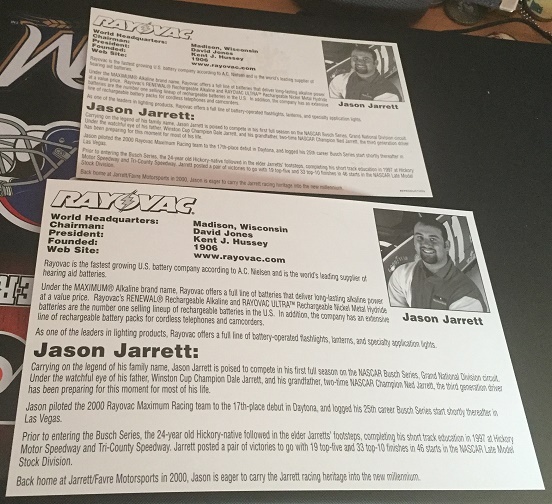 His debut in the Sprint Cup took place in 1999 at the Coca Cola 600, where he would go on to win 22 races, including 2 Daytona 500’s. 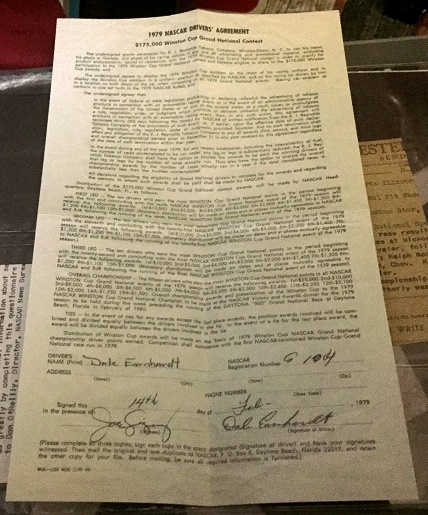 The memorabilia from the Earnhardt family includes a copy of Dale’s 1979 Rookie NASCAR contract, A 1956 Telefax that depicts Ralph’s lone Winston Cup Pole in Hickory, and the first two pages of Ralph’s 1965 NASCAR info sheet. 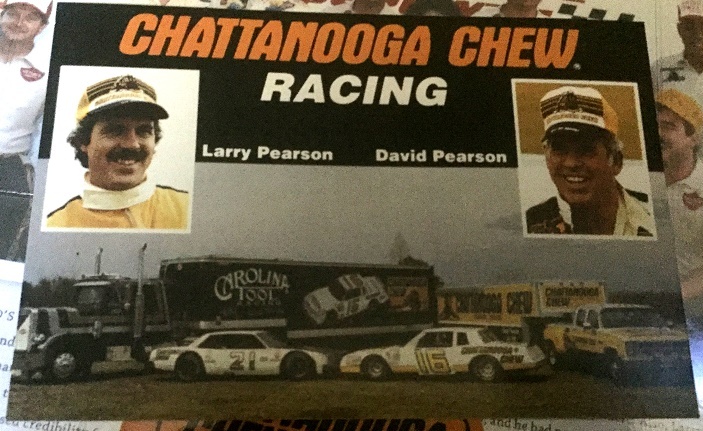 David and Larry Pearson are next featured. David “The Silver Fox” Pearson raced from 1960 to 1986. 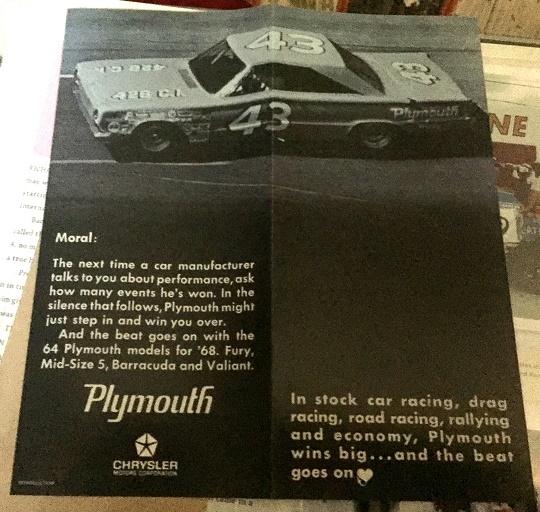 He has 105 Sprint Cup wins, three Sprint Cup championships, he won the 1976 Daytona 500, and has won the Grand Slam. He was one of the 50 Greatest Drivers of All Time, and was elected to the Inaugural Class in the NASCAR Hall of Fame. 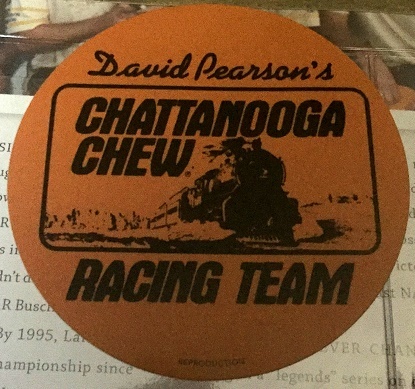 He is second only to Richard Petty in terms of race wins, Petty has 200, Pearson has 105. 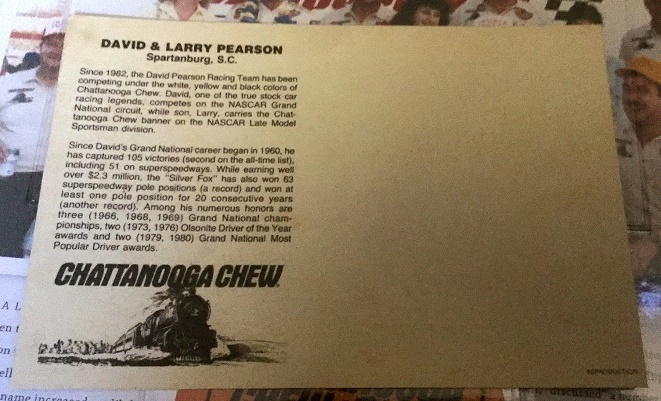 His son Larry Pearson’s Xfinity career was actually very good, with Pearson winning two Xfinity Series championships, one in 1986, the other in 1986, as well as 15 race wins. 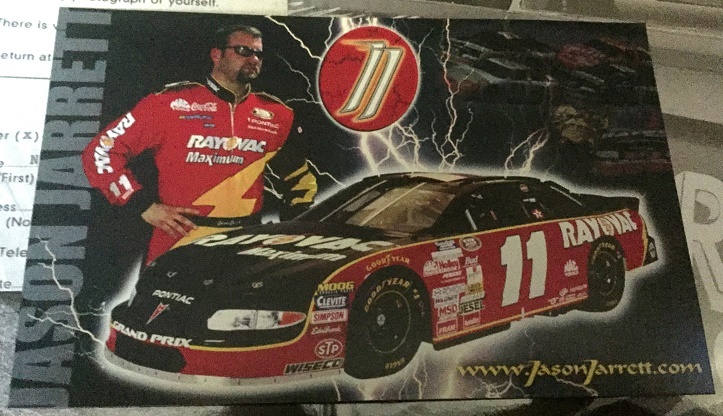 He left NASCAR after 1999. He suffered a serious crash at Bristol in 2010, which has more or less derailed any chance he had of getting his career restarted. 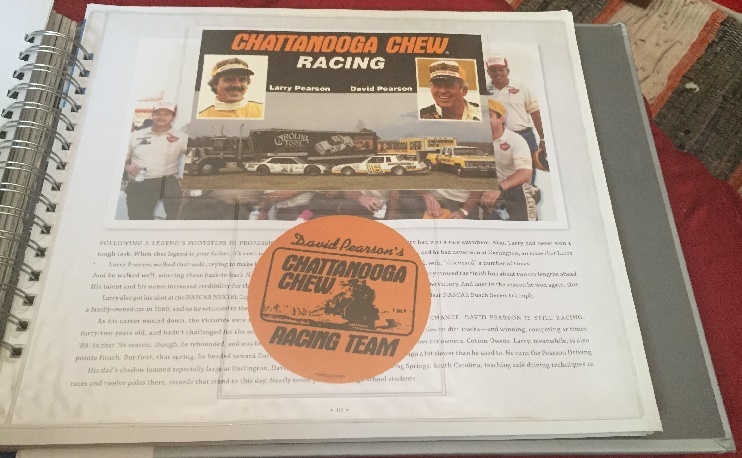 The memorabilia from the Pearson section is a color postcard featuring Larry and David together, and a vintage decal from David Pearson’s racing team in the early 1980’s. 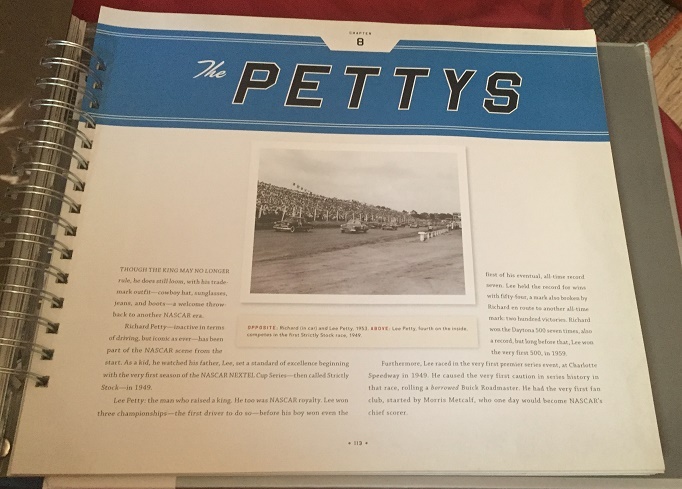 The next chapter features the most important racing family in NASCAR history, the Pettys. 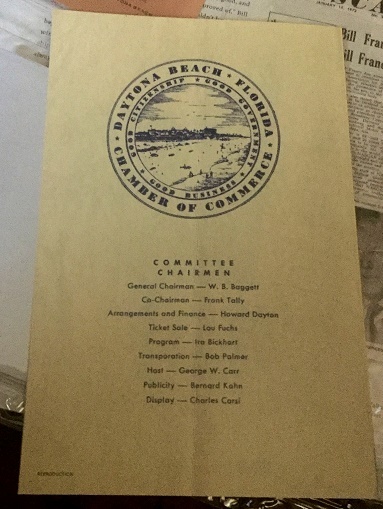 Lee Petty was the first of the Petty drivers, first racing in 1949, Petty won an astounding 54 races, three Sprint Cup Championships, and the first Daytona 500. 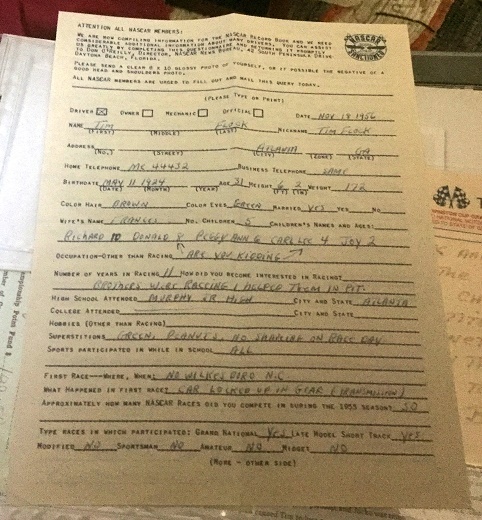 His sons Richard and Maurice had NASCAR careers, Maurice as a crew chief and engine builder. 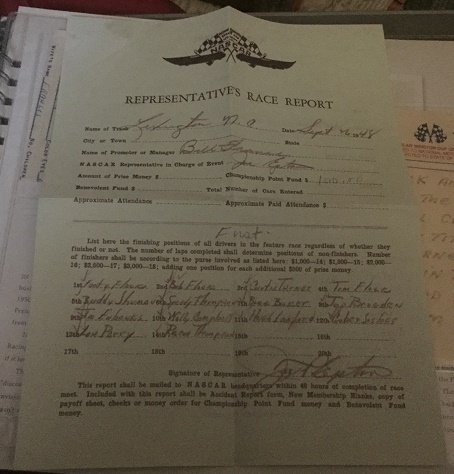 Richard Petty would go on to win just about everything there is to win in NASCAR, including 200 wins, 7 championships, a place on the list of the 50 Greatest Drivers of All Time, and election into almost every racing hall of fame that exists. The family talent was passed down to Kyle Petty, who has 8 Sprint Cup wins, including the 1987 Coca Cola 600. 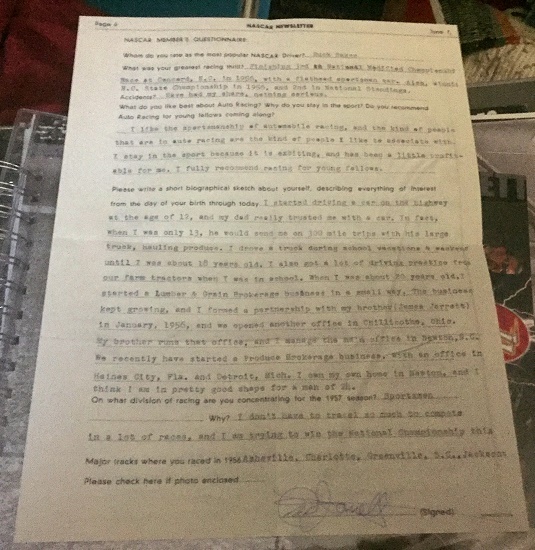 Kyle’s son Adam had a chance at a racing career, and had some hints of success, before dying in a crash at New Hampshire, a little over a month after Lee Petty died in 2000. 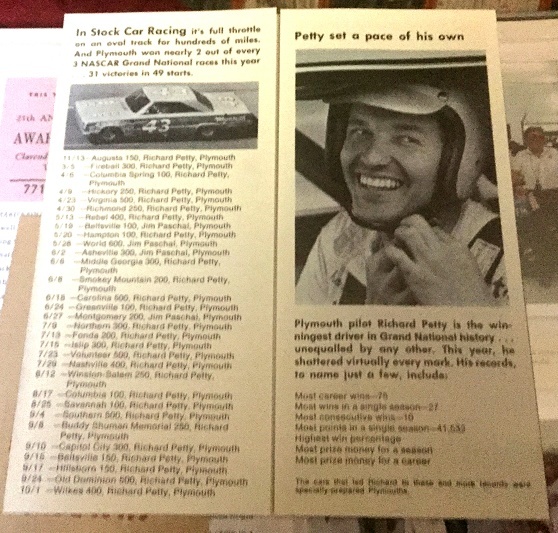 The memorabilia for the Petty family features a ticket to the 1974 NASCAR award banquet, A Plymouth brochure from 1967, Petty’s most successful year, and a pit pass from Heidelberg Speedway in Pennsylvania, where Lee Petty got his first win in 1949. 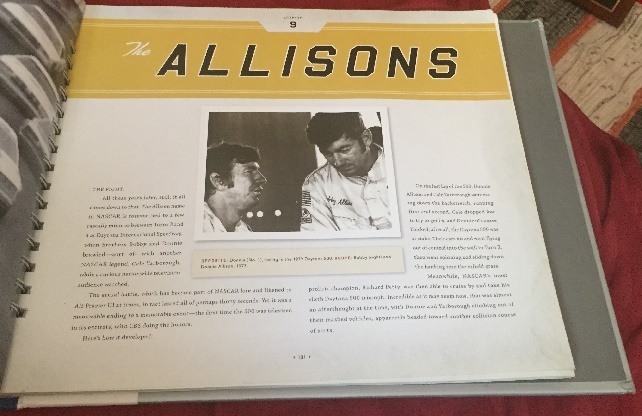 The Alabama Gang, made up of the Allison family are the next one featured. 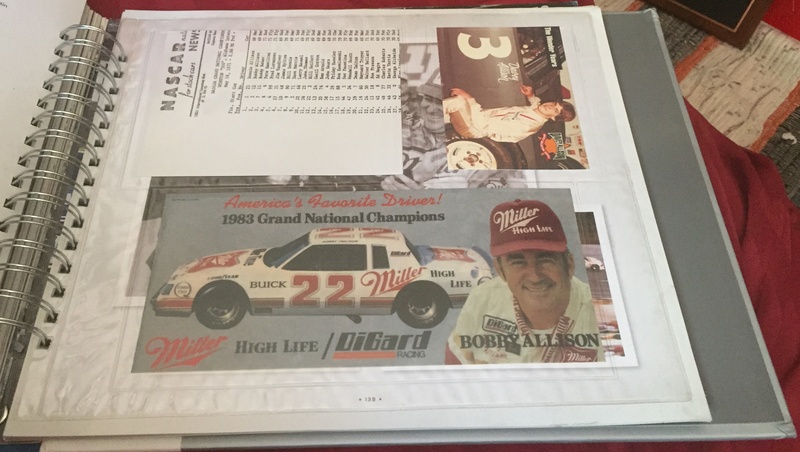 Bobby is the most well-known of the Allison drivers. 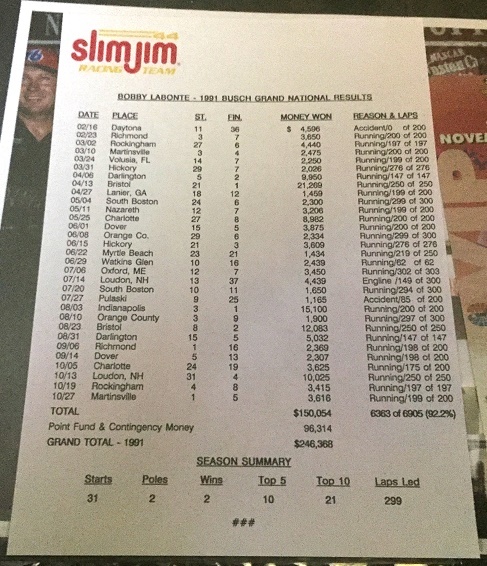 Officially, Bobby has 84 wins, though the number could be as high as 86, and the 1983 Cup championship. Allison also has 15 wins in the Xfinity Series as well. 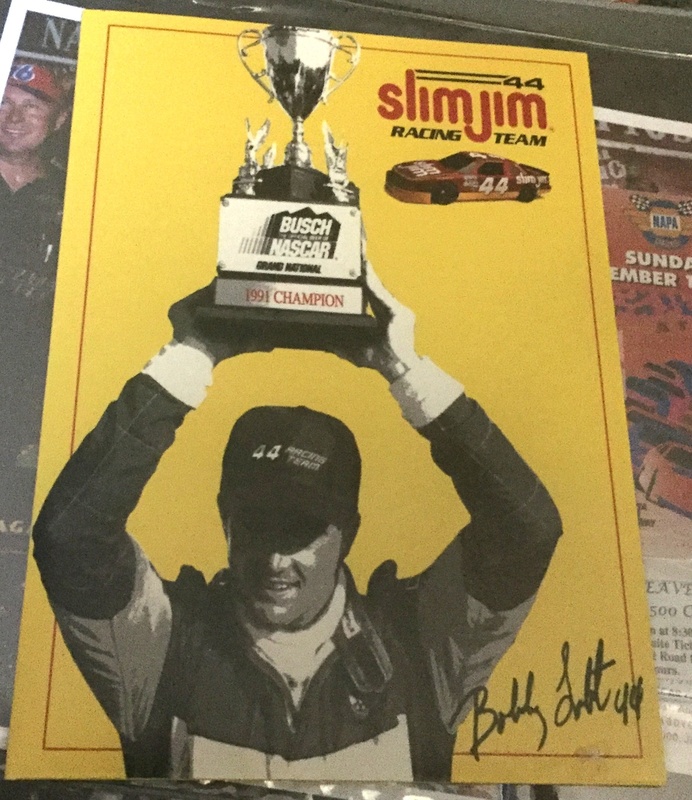 Bobby is one of the 50 Greatest Drivers of All Time, and has a place in the NASCAR Hall of Fame. 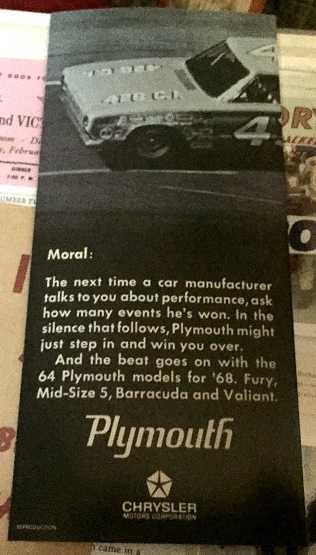 Younger brother Donnie has 10 wins in the Cup Series, but will forever be known for his fight with Cale Yarborough at the end of the 1979 Daytona 500. 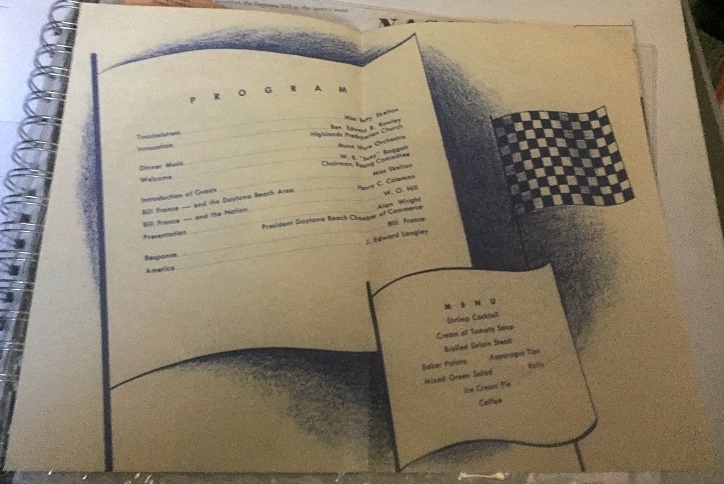 Considered the most important race in NASCAR history, the 1979 Daytona was the first NASCAR race televised flag to flag, took place during an East coast blizzard, and ended with Richard Petty winning the race, after Cale Yarborough and Donnie crashed into each other. As Petty celebrated his win, Donnie and Cale began to fight on the infield. 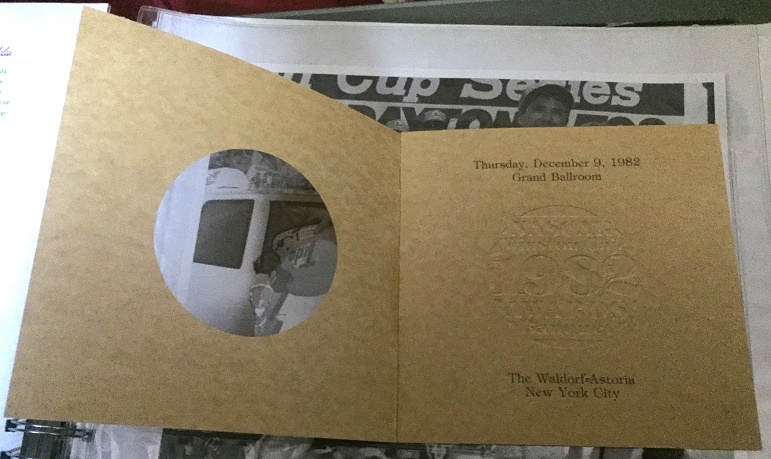 A photo made the front cover of the sports section of the New York Times, and NASCAR’s rise to the top had begun. 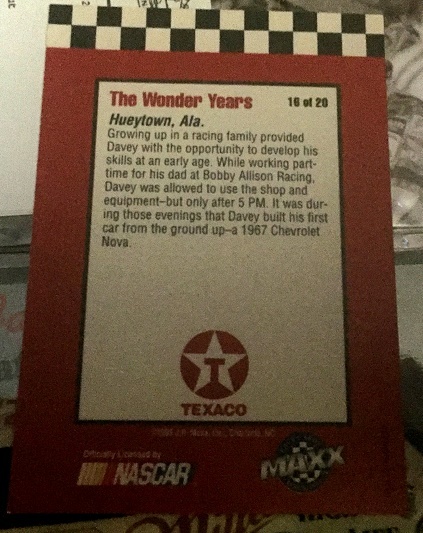 Two of Bobby’s children, Davey and Clifford both started their racing careers in more recent years. Clifford started racing in Xfinity Series in 1990, but was killed in a wreck in 1992 at Michigan International Speedway. 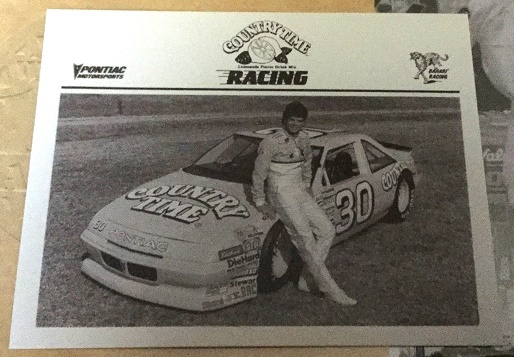 Davey Allison, Clifford’s older brother, won the 1991 Coca Cola 600, the 1992 Daytona 500, almost won the 1992 Winston Cup championship, and has 17 other race wins to his credit. 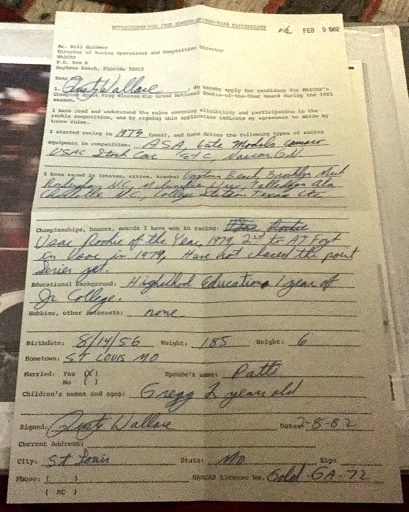 He was killed in a helicopter crash in July of 1993. 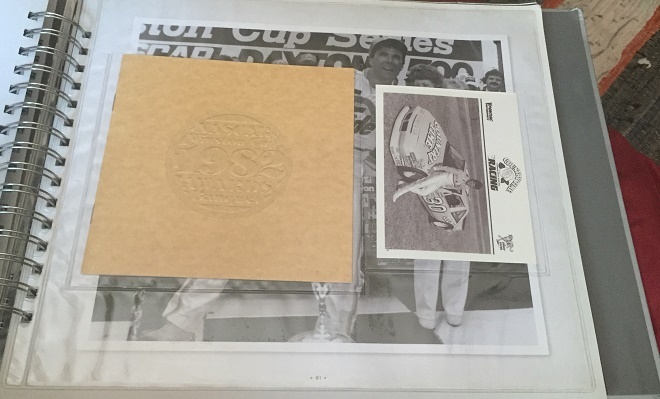 The memorabilia from the Allison section includes a NASCAR newsletter from 1971 discussing the Allison brothers finishing first and second at Talladega, A Davey Allison trading card from 1993, and a Bobby Allison 1983 Championship bumper sticker. 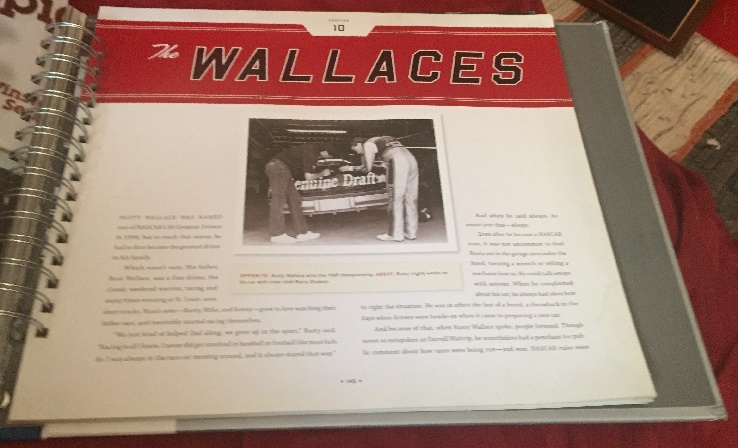 The second to last chapter is about the Wallace Brothers, Rusty, Mike, Steve, and Kenny. The most well-known of the brothers is Rusty. 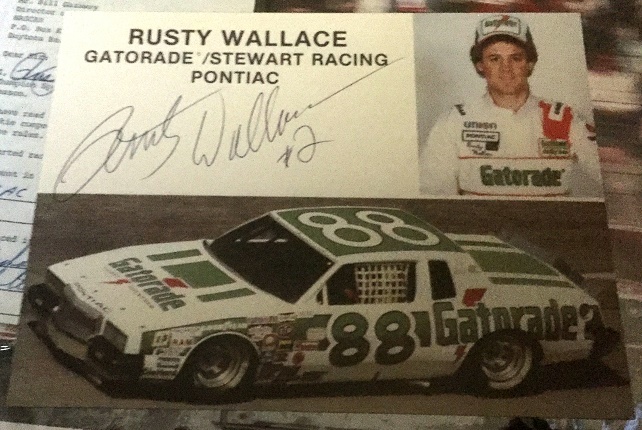 With 55 wins, and the 1989 Sprint Cup championship, and a place on the 50 Greatest Drivers of All Time list, and a place in the NASCAR Hall of Fame, Rusty has earned a place in the hearts of many NASCAR fans. Kenny and Mike, Rusty’s brothers, haven’t had any success in the Cup Series, but both have had success in the Xfinity Series, Kenny having 9 wins, and a 2nd place points finish in 1991, and Mike has 4 wins, and an 8th place points finish in 2008. Rusty’s son Steve is currently working on his racing career, though he hasn’t scored a win in any of NASCAR’s biggest series. The Hamiltons-Bobby Sr. and Bobby Jr.
and The Wood Brothers-Glen and Leonard. 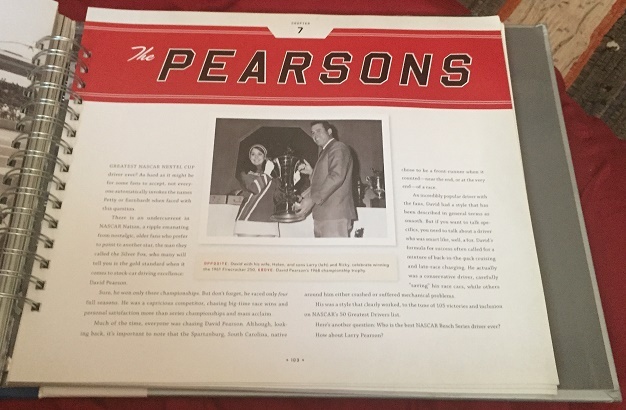 The book itself, even without the memorabilia is a great read too. The book is very well written, and very well done. If you can find a copy, pick it up, and read it. I promise it is worth it. I’d like to take this opportunity to thank John, a friend and coworker for giving me my copy of this book. 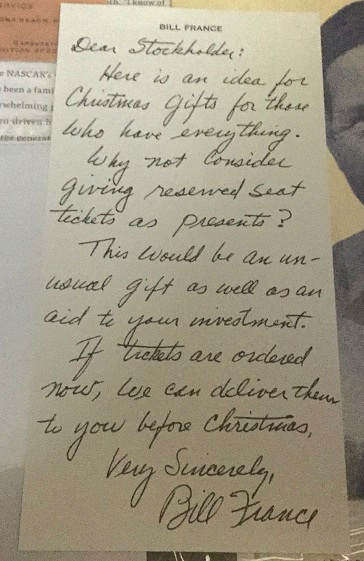 Thanks John!